The euro was trading briefly over 1.12 against the dollar again today after markets turned bearish on the greenback following yesterday’s FOMC minutes (see below). 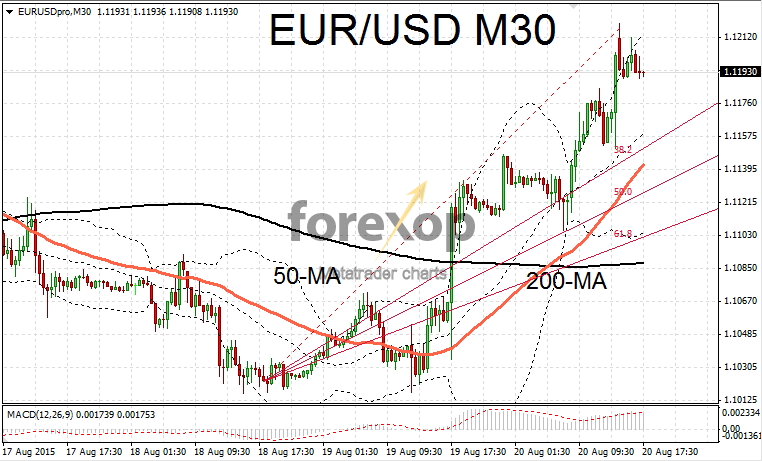 EUR/USD rallied strongly to 1.1219 adding to yesterday’s gains. 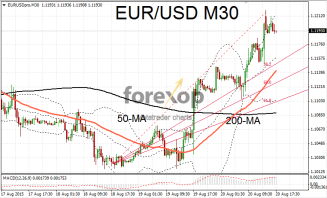 In a bullish pattern the euro rose on strong momentum above the 200-day moving average – this being the second breach in one week. If today’s close remains above this level, this will be for the first time in fifteen months. USD/JPY fell by 0.5% to 123.45 as the pair headed for its first down week in the past three. Yen strengthened after higher than expected Japanese trade figures released earlier this week. Yen normally strengthens in times of global uncertainty as it attracts funds looking for a safe haven. The trigger point for the dollar slump came after the minutes revealed Federal Reserve policy makers still feel the economy is not ready to withstand a rate increase. One policy maker voted for a rate increase while others cited a need to wait to see improvements in the economy. Contributing negative factors included the strong dollar, and rising commodity prices both of which will supress price increases keeping inflation lower than target. The rate of inflation still remains well off the Fed’s 2% target. Yesterday’s consumer inflation data put core inflation at a meagre 0.1% in July. US treasuries yields dropped sharply as markets readjusted their expectations for the first interest rate rise in nearly a decade. The odds of September being the lift off point have fallen somewhat. This week’s jobless numbers showed that the US labor market remains relatively upbeat. New jobless claims stood at 277,000 to the end of last week. That was ahead of the forecasted number of 272,000 but still remained within the margins of a growing workforce. On the positive front US home sales rose to the highest level in five years. The National Association of Realtors said on Thursday that new home sales were up at 5.59M units over the twelve months to July.